It's very possible that you don't recognize the man sitting with Nate. He is David Seidler, and he won an Oscar for his amazing screenplay for The King's Speech. 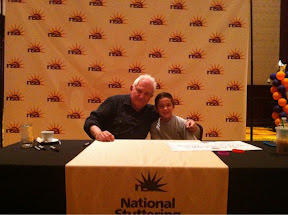 He was also the keynote speaker at the National Stuttering Conference this year. During his speech, he said "love and support are more important than mechanical devices" when thinking about how to help people who stutter. I have to say that I wholeheartedly agree with him! He was also extremely gracious and took time not only after his speech, but also the following morning to sign autographs and pose for pictures. This picture was taken the morning before we headed to the airport to fly home. Definitely a special memory, and a wonderful picture! MasterLock is helping parents & students get ready for back to school with some advice (and a sweepstakes!) 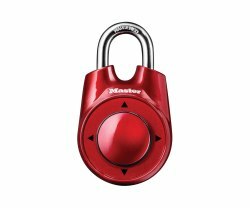 You can visit MasterLock's website for all the details. If I was going to share back-to-school advice, I think I'd have to share two pieces of advice. The first is: Get everything ready the night before! 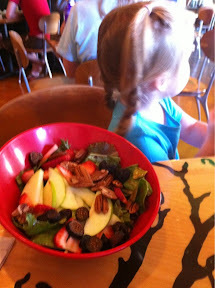 We make sure the backpacks are packed, lunches are either prepared or planned, and the next day's schedule is discussed. This makes mornings (and the entire day) go so much easier!! I never got to write a post wrapping up last school year, and my boys are heading back in just a couple weeks. We did make the decision to stick with public school again this year, and the boys are looking forward to the new school year. What about you? She told me about a restaurant in Tempe that she visited and liked and I was lucky enough that she treated Lydia & I to lunch there on Saturday. 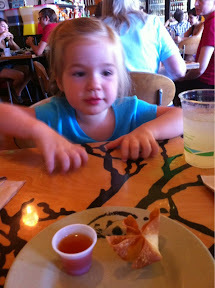 Green is located in a strip mall on Scottsdale Rd, but it's easy to find once you know it's there. It's 100% vegan, so she doesn't have to worry about any hidden dairy, and knows that if she does have cheese on a dish, it will be vegan cheese. We had the crab puff as an appetizer. I know you only see one, but there were actually 4 -- the other 3 were eaten up faster than I could get the camera out. They were delicious, with a nice addition of garlic, and definitely creamy. They are as good (and even better than some!) dairy-full crab puffs I've ever eaten. My sister also liked them, and is happy she knows where to find some when she has a craving. 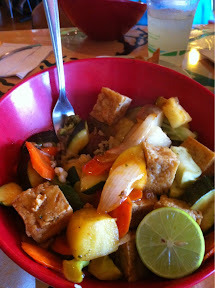 I had the sweet & sour with fried tofu and brown rice. It was a huge serving, and very filling. 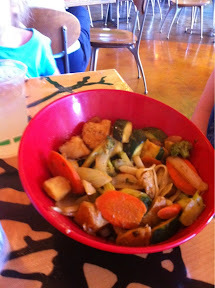 There were chunks of apple, lightly cooked, as well as pineapple, carrots and other vegetables. I'll admit I wasn't crazy about the fried tofu, but that's just because I don't like the texture. My sister says I should try the mock chicken next time, and I will. My sister enjoyed coconut curry with mock chicken. She said it was delicious and is the same dish she had on her last visit. We saw some people eating Tsoynamis -- which are vegan ice cream treats. They looked scrumptious, but we were full. Next time we'll visit for just a Tsoynami! The restaurant is decorated very cute inside -- with a bright green ceiling and tables scattered about. There is a small seating area with a couple couches as well. One wall is covered with car doors, something that Lydia found very interesting. You order from the counter and then they bring your food to your table once it's prepared. The staff is friendly and happy to answer any questions you might have. The prices were very fair, and the food we had was delicious. We wish there was one farther east, but it's a place we will definitely visit again and again. If you're looking for good food in the east valley, check them out! You can find Green at 2240 N. Scottsdale Rd, #8, Tempe, AZ. Their menu is posted (minus daily specials) on their website. 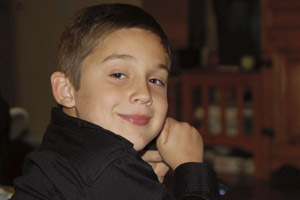 This video was shown at the closing ceremony at the National Stuttering Conference last week. The gentleman who put it together is very talented, and it is a great video showcasing the fun of the conference. Nate is shown in a couple different spots, but most noticeable around 4:15. He was embarrassed when he saw the video, but I love his enthusiasm. If you're a person who stutters, I can't recommend attending a conference enough. What an amazing way to connect with others who stutter, in an extremely supportive and educational environment. The conference is in Tampa, FL next year! Nate and I got back last night from the National Stuttering Association's Annual Conference in Fort Worth, Texas. It was the first conference we attended, and we had an amazing time. I have attended various business conferences in the past, but I have to say that the group of people we met at the stuttering conference were some of the nicest, kindest and warmest people I have ever met at a conference! It was 3 1/2 days of smiles and friendly greetings. The conference welcomes all ages -- from kids who stutter through adults who stutter and those who love people who stutter. I was extremely impressed that there were workshops and sessions catering to everyone's different needs and interests. Throughout the conference, there were sessions set up for the kids ages 7 - 12, as well as teens. Nate got to meet a cowboy and his horse, practice his roping skills, learn how to juggle, and tons more! While he was in these sessions, I was able to choose from sessions geared specifically to parents, or I could attend sessions geared to adults who stutter or sessions presented by researchers and those who work with people who stutter. I was a bit overwhelmed by all the choices, but I was grateful that there were so many choices!! Nate and I arrived in Texas a day and 1/2 before registration and had the chance to wander around Fort Worth and enjoy the sights. While the conference was wonderful and I hope we can attend as an entire family next year in Tampa -- I think my favorite part was spending 6 days with Nate one-on-one. We ate out, talked a TON, enjoyed exploring the streets around the hotel, and watching shows about guns, cars, and insects (just like books - he prefers his television to be non-fiction.) It was an extremely special experience to spend all that time with just one of my children and get to know him a little better than before. 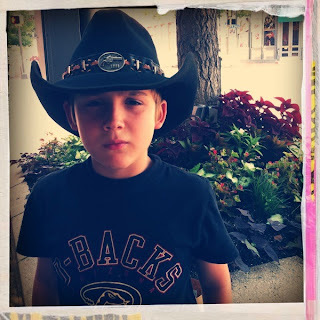 Before leaving for Texas, Nate knew he wanted a pair of cowboy boots and a cowboy hat. On our first day there, he found both and was thrilled. He's trying to put on his tough cowboy face in the picture above, but trust me when I tell you his face was more often broken into a wide grin during our visit. A couple people recognized Nate from his YouTube videos, and while he tried to act humble, I know it thrilled him. When we talked about the conference, he did say to me "I didn't really learn anything about stuttering -- but it was cool to meet so many people who stuttered!" I think that's what the conference is all about. The chance to be in a room filled with others that are like you in a pretty significant way. The NSA conference made that happen, and they did it wonderfully. Did you know that Ronald Reagan declared July "National Ice Cream Month" back in 1984? I confess that I love ice cream and so does my family! The kids were excited when these adorable new Zhu Zhu pets landed on our doorstep, thanks to Cepia and Mom Select. Not only were the new pets adorable with their bright colors and patterns, but the ice cream shop was precious! My favorite was the ice cream truck, complete with a hat for the Zhu Zhu driver. You can find them at all major retailers, including Amazon . They would make a great gift for a summer birthday child, or for anyone who loves ice cream! Disclosure: I received the ice cream set and Zhu Zhu pets from Mom Select and Cepia to facilitate this review. No additional compensation was provided. I am currently in Texas with Nate attending a stuttering conference. I didn't bring a laptop, thinking I could blog on my phone and iPad, but I'm not so sure about my klutzy fingers. I have lots to say not only about the conference ( well it just started an hour ago but I'm sure I'll have lots to say) but also about traveling and spending time with just one child vs 3. I'm missing my other 2 kids though and also my hubby. The best news though is that I am feeling so much better so we can fully embrace this trip. In April, an article I wrote about local stuttering support groups was published in a local parenting magazine. 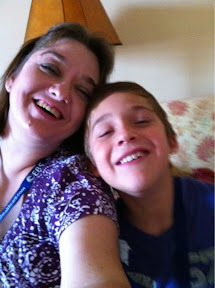 Since Nate & I are leaving in a few days for the National Stuttering Association Annual Conference, I thought it would be a good time to share the link to the article -- The Kid's Speech. This morning, I woke and am finally feeling like myself again. For the first time since early May. I was committed to our trip to Texas no matter how I felt, but I will admit that I am grateful that I am finally feeling better. I expect things to be back to normal shortly! I'll be blogging about our trip and the conference, so keep reading!